In countries that embrace both capitalism and democracy, there is an appreciation of the ability to buy any legal product from any vendor within the country and from an allied country. That freedom is under assault by radical Islamists and far-left progressives. The ability to purchase legal goods from a company in good standing from an ally is natural. It is up to the individual – say an American citizen – to choose to buy an item to his liking – perhaps Droste Chocolate from the Netherlands or an Audi automobile from Germany. People are not compelled to purchase the item either because of a preference regarding the item (maybe they don’t like the taste of Droste Chocolate) or because they have an issue with the government (not buying anything German because of the Holocaust.) The legal structure of the society enables each person to make a buying decision on their own. However, such rights are not so absolute when it comes to SELLING something. As examples, a person cannot decide to only sell their home to a white person any more than a store owner can prevent a gay person from buying a soda. Anti-discrimination laws specifically disallow such actions. A business or individual can decide not to sell something, but once a decision is made to sell a product, everyone must have equal access to acquire the item. 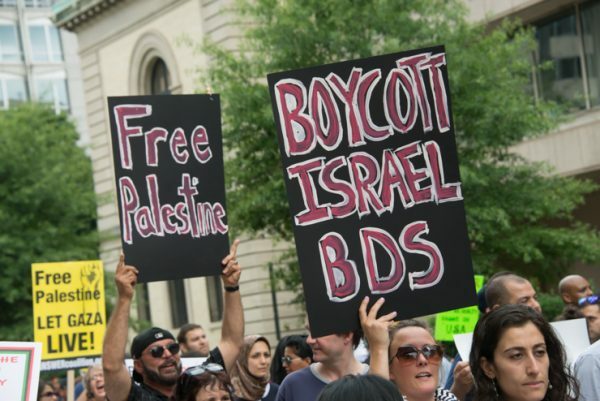 The Boycott, Divestment and Sanctions (BDS) movement against Israel portrays itself as a human rights effort to pressure Israel to reach a peace agreement with the Palestinian Authority. It is not. It is an anti-Semitic movement designed to eradicate Zionism launched by Radical Islamists that has begun to co-opt far left-wing Progressives (RIAPs, Radical Islamists and Progressives). There are two parties in this conflict. As opposed to the apartheid regime in South Africa which limited freedoms for its own citizens, the Israel-Arab conflict is between distinct parties. The United Nations and dozens of Arab and Muslim countries back the Palestinian Authority. The Palestinian Authority has tremendous support from many countries around the world, including the United Nations itself. The blacks in South Africa were an isolated minority trying to fight for rights against its own government. Israel has attempted to forge a peace agreement. For several decades, the Israeli government has tried to reach a peace agreement with the Arabs in the region. The dynamic here is not one of desire to reach a settlement, but a gap between the positions of the Israelis and PA. The Israeli government has a good track record. The Israelis gave up land for peace with Egypt and were able to reach a peace agreement with Jordan. Israel gave control of Gaza and sections of the West Bank to the Palestinian Authority. For their part, the PA has not even been able to reach any settlements with rival parties. Which party really needs pressure / help in getting to a peace deal? in Washington, D.C., August 2, 2014. More to the point being addressed here, BDS prevents ordinary people from buying the Israeli products they desire. As noted above, any individual can make a personal choice to avoid buying products made in Israel or the Israeli territories in Judea and Samaria. But establishing a boycott infringes on the rights of other people who very much want to purchase the products and services from the leading liberal democracy in the Middle East and North Africa. If progressives really cared about human rights, shouldn’t they have lambasted the Obama Administration for not only handing $150 billion to Iran, a country that hangs gays by cranes in the middle of Tehran and executes minors? Shouldn’t the progressives have been further incensed with Obama for promising to import Iranian rugs, caviar and pistachios (see page 67 of the JCPOA). How can progressives approve of the importation of goods from a country that executes gays and minors, but seek to boycott a country which has only reached a peaceful settlement with some of its Arab neighbors? It is because the RIAPs believe that Israel is a completely illegal Zionist Project. Iran and other regressive Islamic societies like Saudi Arabia may be vile, but they are viewed by the extremist groups as legitimate. Meanwhile, they contend that Israel is illegal at its core and should cease to exist. Consider the platform in Black Lives Matter “Invest – Divest” which declared America’s support for Israel, its “Global War on Terror,” and AFRICOM as simply tools of colonialism under the mask of combating terror. Under the BLM worldview, Israel is an extension of the racist American colonial project, putting Jews in homes where they do not belong, stealing from people of color. These extremists do not simply have their own disturbing anti-Semitic worldview in which Jews are uniquely denied their history, heritage and basic human rights, but want to force every person to comply with their anti-Semitic agenda. They seek to rob every American of their choice of doing business with Israel. BDS is the toxic combination of stealing individual freedom and forcing people to participate in antisemitism. Organizations that participate in BDS should be fined in the same manner as those that have policies that discriminate against any group. This entry was posted in Iran, Islam, Israel, New York Times and tagged BDS, New York Times by First.One.Through. Bookmark the permalink.